Introduced in February 2019, this hand-painted superwash wool blend, features blocks of speckles and solid portions. This fun yarn will knit or crochet up with delightful playfullness. Just looking at the colors sweep away stressful thoughts. So just imagine knitting or crocheting with it. I see this in some simple scarves, cowls and hats. If you are extremely outgoing, whip up a playful vest! And oh, don't forget lap blankets for you or the baby, or pillow covers to pop a little cheer or accents to your home. 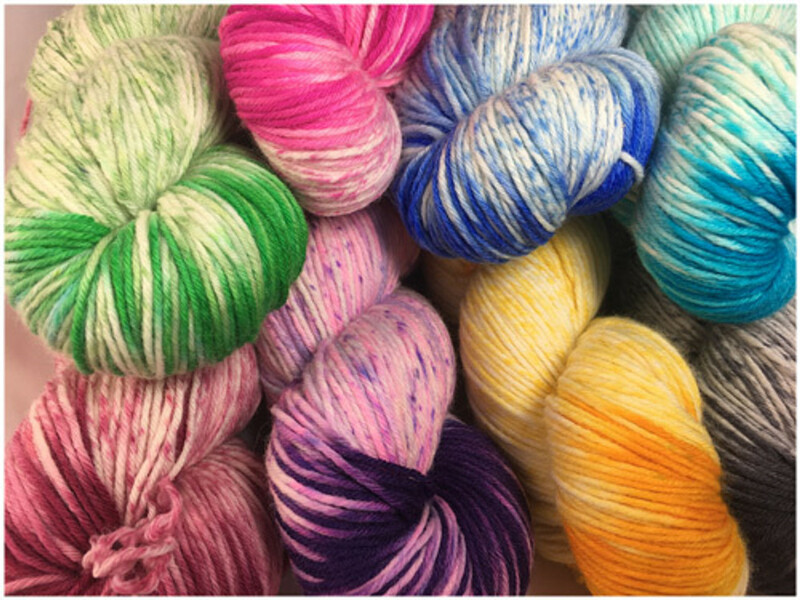 As there are no dye lots, we recommend buying enough yarn at one time to complete each individual project. Knit or crochet with two hanks in assorted rows (2 to 4). This will assure an overall blended effect. Knitting Gauge: 5.5 6.5 sts = 1"